Each morning we fresh-grind our own premium whole wheat. Click Here to learn more about wheat. Our Breads are Sweetened with Honey, Molasses, and Brown Sugar. We don't use additives, preservatives, chemicals, dough conditioners, or other ingredients you can't pronounce. And, unlike a lot of bakery products out there, we NEVER add water to a mix or "bake off" frozen product that came in on a truck, ect. (yuck!). With a few special exceptions, we don't add oils, dairy, or fat to our breads. Our signature bread, Honey Whole Wheat, has only 5 ingredients: fresh-ground flour, water, yeast honey and salt. We keep our breads simple because we care (and we know you care) about taste and nutrition. Customers love that our bread stays fresh for 7-10 days! You can find Bread Care Instructions by clicking here. We use the best wheat in the world! 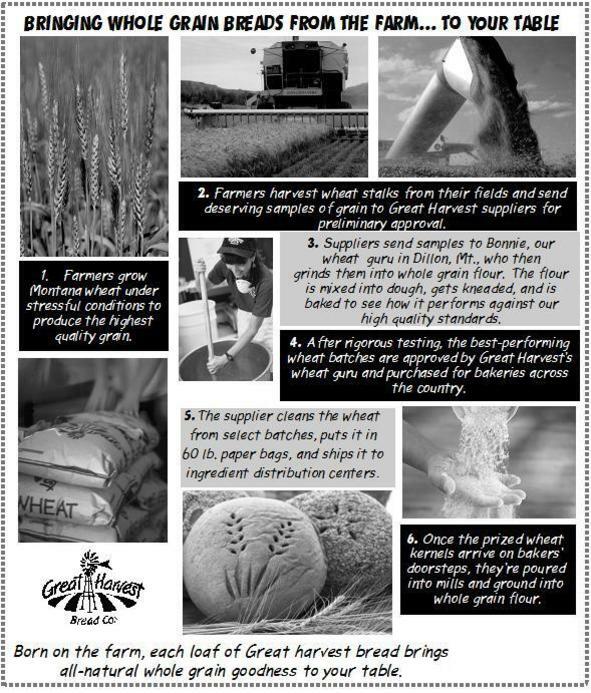 **See BELOW**Nothing influences our bread quality more than wheat. High quality wheat is so important to us that we have our very own Wheat Specialist whose job is to research and select wheat for our bread.